This work is aimed at putting forward the potential capacities of an ultrasonic indicator to control concrete damage by means of non destructive testing. We first present the difficulties met with in the course of the realization of this type of measurements and of their interpretations in an industrial context. Subsequently, we focus our study on the case of concrete degradation by alkali reaction. Specimens are damaged according to accelerated expansion procedures. The evolutions of the transmitted ultrasonic waves are explained by microstructural alterations of concrete in the damaging process. The analysis of the ultrasonic information is carried out from time and frequency parameters. An analysis by wavelets leads to the creation of time frequency images. The device allows to bring to the fore an ultrasonic indicator particularly worthwhile in in-situ testing cases. Concrete is a material with a very heterogeneous composition. This heterogeneousness is linked up both to the nature of its constituents (cement, sand, aggregates, reinforcements, protection,.) and their dimensions, geometry or/and distribution. It is thus highly possible that defects and damaging should exist. Non Destructive Testing and Evaluation on this material have motivated a lot of research works. Several syntheses have been proposed  and . There are many causes for concrete damage. The consequences are usually an alteration of the mechanical characteristics which correspond to an evolution of the crack rate, of porosity in the material and/or the state of corrosion of the reinforcing pieces. The compression strength is easily measurable, it has been evaluated by a lot of authors , ,  from non destructive tests. The tests have to be easily applied to the in situ control case. These evaluation methods are based on the capacity of the surface material to absorb the energy of a projected object (Sclerometer, Windsor probe test,. )or on the resistance to extraction of the object anchored in the concrete (Anchor Edge test,.) or above else on the propagation of acoustic waves (acoustic emission, impact echo, ultrasounds).The acoustic method allows an in core examination of the material. Each concrete is a particular case and has to be calibrated. The non destructive measurements have not been developed because there is no general relation. The relation with the compression strength must be correlated by means of preliminary tests. In ultrasonic testing, two essential problems are posed. On the one hand, bringing out the ultrasonic indicator and the correlation with the material damage and on the other hand the industrialization of the procedure with the implementation of in situ testing. The ultrasonic indicators made use of always stem from velocity and/or attenuation measures. But their evaluations are generally uncertain namely when they are carried out in the field. The velocity of the ultrasonic waves in an isotropic medium is a function of the Lamé coefficients and the material's density. It must lead to the mechanical characterization of the concrete either at the initial state or when damaged. Its apparently easy measurability has encouraged the development of correlations with the compression strength. Some authors  explain that the propagation laws and the experimentation of ultrasonic waves cannot be applied to the case of highly heterogeneous, anisotropic, visco-elastic and dispersive material. A general relation cannot possibly be established. The velocity of the ultrasonic waves evolves with a number of parameters such as the nature and quantity of the constituents, the age of the concrete, its damaging, the state of stress in the structure, the reinforcement, humidity rate, and temperature as well as the shape of the specimen, the wave's frequency and the command of the length covered in the concrete. The velocity measurement on a specimen also poses the problem of the guided waves. If the dimensions of the specimen perpendicular to the direction of the wave's propagation are close to the wavelength, the specimen can vibrate radially. The shift from an infinite medium into a finite one then generates so-called 'guided' waves and their group velocity may differ from the one recorded on the unlimited structure.. In a supposedly elastic homogeneous micro-cracked medium, Berthaud  analyses the under-load elasto-acoustic coupling by using a criterion of crack closure. The author clearly shows the sensitiveness of the velocity to the state of crack opening bound to the state of stress. It raises in the process the issue of the release of the stresses during the sampling of a specimen destined for laboratory testing. The in situ measure differs from the one made in a laboratory. Apparently measuring the ultrasonic waves' velocity in concrete requires the command of a lot of stresses. The in situ application rapidly gets complicated all the more so since the length covered by the wave is not perfectly mastered. Attenuation can be divided into three parts: beam dispersion, absorption by the material and diffusion during the interactions with the diffusers on the ultrasonic wave's route such as grains, pores, cracks and bars. The nature, shape, density and distribution of the obstacles in the material are prominent in attenuation phenomena. The wavelength l and thus the frequency f compared with the size of the diffusers D or the size of the specimen determine the attenuation in a heterogeneous medium. A1, a, b and c are concrete constants. The first term characterizes absorption whereas the second one is related to diffusion. Some authors  measured these coefficients for different types of concrete and showed that sand and mortar are the most attenuating elements. The ultrasonic waves used in concrete generally present wide bandwidths. The exploitation of frequency processing allows to put forward the character of concrete in the course of setting  or damaging . Concrete is shown as an evolutive filter. Attenuation is different for each frequency. The behaviors of the low and high frequencies may diverge. Modeling the ultrasonic waves' propagation in heterogeneous mediums , , led to the calculation of the transmitted power through a material presenting single-sized diffusers uniformly distributed. They express, in the case of simple diffusion, the attenuation coefficient as a function of the diffusers' number N, of the section S, of the mean section of diffusion g and of the distance on the propagation axis dx. as the g takes into account the nature of the material as well ultrasonic wave's frequency. It is possible to take into account successive interactions of the wave with multiple diffusers with the same nature permits to consider a more realistic modelling. The application of these models to concrete has not yet been experimentally validated. Measuring attenuation is experimentally difficult to perform since the access to two successive echoes in the specimen is required. And as the high frequencies are very attenuated, they cannot return the two echoes and the law frequency signals have too long a duration for being capable of easily separating the two successive echoes. The exploitation of a transmitted or reflected ultrasonic signal may rapidly become tricky. It is necessary to work on normalized specimens and in controlled experimental conditions. The case of in situ measurement is even more problematic when the distance covered by the wave is not controlled correctly. The work we have developed is aimed at showing that it's conceivable to correlate the state of damage of a concrete and an ultrasonic indicator other than velocity and to apply such an in situ operation without commanding the length. Damaging by alkali reaction results from a chemical attack of silica by ions from the alkaline salts of the cement. It generates expansive gels which develop in the cracks and pores of the concrete. The internal stresses increase and cause a cracking. A new gel generation cycle may start and new cracks may appear. The development conditions of this type of reaction are conditioned by a high alkali content in the concrete, by the presence of alkali sensitive aggregates and by a high water content. A high temperature increases the reaction's kinetics. The resulting damage is the creation of cracks with dimensions varying by up to several millimeters. The cracks have a random orientation if there are no stresses, or follow the directions of the stresses. The gel may bleed. The structure expands and may be distorted globally. Different tests exist to follow this aging :measuring the overall distortion of the work, analyzing locally the state of the cracks, carrying out mineralogic and petrologic analyses; yet there are no structure in-core examination methods. In a sample that is not submitted to any damaging, the increase of the bridging between the grains in young concrete induces a higher energy transmission. This is all the truer for high frequencies that tend to be diffused by intergranular spaces. A decrease in HF attenuation should then follow. In parallel, the group velocity increases along with the elasticity modulus. In a sample that is submitted to an alkali reaction damaging, we meet with three stages characteristic of the process, which are synthesized in the following chart. In the first stage the grain bridging and the pore filling up with expanding gel facilitate the transfer of waves, namely for high frequencies. In the second stage, the crack generation increases the rate of diffusers as well as the high frequencies attenuation. The waves' velocity decreases with the elasticity modulus and the low frequencies with important wavelengths as compared to the defects' dimensions then become prominent in the transmission. In the third stage the gel's expansion into the new cracks facilitates the wave transfer. The attenuation decreases and the velocity increases. We endeavor to supervise these data at each stage of the damaging process. The samples are submitted to dilatation tests accelerated in a reactor maintained at 60°C and 100% of relative humidity. The aging duration is 80 days. The samples are taken out of the reactor at regular intervals and after cooling, are submitted to measurements. 7*7*28 cm3 samples are used for dilatation measurements in order that the kinetics and evolution of the reaction, as well as the state of damage of the concrete be controlled. Samples with 160 mm in diameter and 160 mm long are submitted to ultrasonic tests carried out by transmission by means of two 24 kHz transducers and a Pundit-type generator or by a couple of 100 kHz transducers (velocity measurement). The signals are made of 10,000 points for a 5 milliseconds signal. First the data deduced from the signals are the group velocity of the waves and their Fourrier Fast Transformation by means of a rectangular window opening. The dilatation and group velocity measures as a function of time (figure s 1 and 2) display the evolutions of concrete during the reaction. The sound specimens expand to a maximum of 0.01%, which is less than the dilatation threshold of 0.02% authorized in France. The specimens are not submitted to a desiccation shrinkage thanks to their being kept at a 100% relative humidity. The doped specimens notably expand from 10 days on. This growth plateaus after 40 days at 0.16%. It is much beyond the authorized dilatation threshold. The initial group velocity of the waves in the specimens is 4,300 m/s. It increases steadily for the sound material. As for the specimen that is being damaged in the course of the test, we will remember 4 points and 3 zones to be noticed in the evolutions shown on figure 2. The evolutions are in agreement with the 3 stages considered above. The concrete is not damaged if we refer to the dilatation curves. The velocities of the sound and damaged specimens evolve in a similar way. The gels are developing again, the cracks are being filled up and the differences of velocity are diminishing. The evolution of the group velocity varies according to the age of the material. It allows to control the alkali reaction damaging in the case of our specimens. But in front of the uncertainty of the in situ velocity measures as expressed above, we cannot retain it as the sole indicator possible. The Fourrier Fast Transformation of the signals obtained by means of 24 kHz central frequency captors bring important data on the distribution of energy in the spectrum. The analysis of the FFT shows that the 24kHz frequency belonging to the spectrum is noticeably constant with the age of the concrete. In parallel, 39 and 53 kHz higher frequencies evolve a lot. The ratio of high frequency amplitude (53 kHz) to low frequency amplitude (24 kHz) permits to monitor these evolution. Between the sound and damaged specimens, very different evolutions can be observed. For the non doped samples, this ratio increases. The intergranular bridges become denser and the energy of the wave carried by high frequencies increases. For the doped sample, the ratio shows an important trough (point 3) for the development phase of the cracks. The latter diffuse the wave's high frequencies . The low frequencies are then prominent and despite their wave lengths being more than the length of the cracks, the interactions are strong thanks to the collective effect of the diffusers. Controlling the damage on specimens is possible from some attenuation measures, but the in situ measurement is nearly impossible on concrete. The time-frequency analysis simultaneously gathers the data about time and frequency. The principle consists in studying the correlation of a Jaffard type wavelet . It is displaced on the time axis of the recorded signal. The wavelet is expanded incrementally hence inducing the frequency to diminish. The examination thus made according to three dimensions: time, frequency and amplitude of the wave. The latter is carried under the form of a color or gray level scale. Fig 4: Time-frequency analysis applied to the cases of sound and damaged specimens. 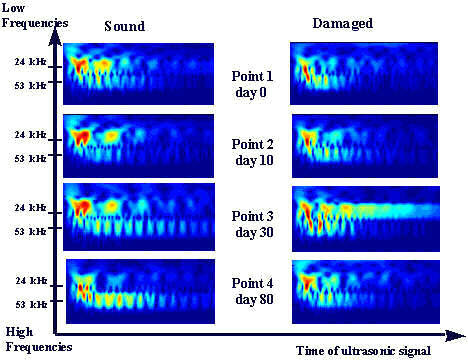 Figure 4 presents the comparison between the analysis carried out on the 24 kHz central frequency ultrasonic signals transmitted through the sound and damaged specimens for the four noticeable points defined above. The scale of frequencies is inverted in the image. The observations confirm those made previously. The additional content of the time-frequency analysis lies in the temporal distribution of the data for each frequency. In the sound specimens, the high frequency amplitude increases. Bridges ensure a better transmission of the waves. The latter meet with more potential diffusers. The reflections are multiplied and the courses of these high frequencies become complex. These waves lose their coherence with the initial signal and their arrival on the receiver transducer is broadly expanded over time. In the damaged specimens, it is clear that the low frequencies are prominent at the age of 30 days when the cracks have developed. The high frequencies propagation is then interrupted by the presence of cracks that are diffusers with important dimensions. These cracks are in a position to diffuse the lowest frequencies and the duration of their presence in the signal increases according to a process similar to the once described above. At the age of 80 days, the diffusers are filled up with gels and all the frequencies recover their previous transfer conditions. The time - frequency analysis permits to study the whole of the acoustic parameters of the ultrasonic signals simultaneously. It allows namely to bring out the lengthening or shortening of the transmission duration for each frequency which may be linked to the attenuation phenomena and hence to the size and density of the diffusers present in the material. The non destructive testing of the damaging of concrete is as complex as the material itself. The usual ultrasonic indicators are difficult to implement. The velocity measures allow to obtain an overall information on the state of the material, but leave only few expectations about the knowledge of distribution elements and a link other than the one specific to the case under study. The attenuation measures allows to follow the influence of the diffusers on the waves' propagation. Their realization is difficult and makes it unlikely to identify smaller-sized diffusers such as cracks in the damaging process of the structure. The analysis of the time - frequency images brings about additional data as compared to the two previous parameters. The temporal distribution of the presence of a known frequency in the ultrasonic signal may be considered as an additional ultrasonic indicator. It is then conceivable to appreciate diffusion and attenuation. A previous processing such as deconvolution may be exploited prior to the time-frequency analysis. In the case of the in situ measure, the accuracy of the covered distance is no more an essential parameter if we work with time-frequency analysis. The acquisition of a signal, be it transmitted or reflected, may be sufficient. We do not measure the velocity. In the case of the absence of echoes, it is even possible to consider working from backscattered waves. Berthaud Y. Damage measurements in concrete via an ultrasonic technique, Part II Modeling, Cement and Concrete Research, vol 21, n° 2-3, 1991, pp 219-228. Selleck, S.F and al Ultrasonic investigation of concrete with distributed damage, ACI Materials Journal, ISSN 0889-325X, Vol. 95, n°1, 1998, pp. 27-36. Gross. D., Zhang. Ch.. Wave propagation in damaged solids, Int J Solids Structures 29, 1992, pp 1763-1779. Vanneste C., Feng S., Sornette D., Non -Destructive Evaluations in Multiple-Scattering Media, Europhysics Letters, Vol 24, n° 5, 1993, pp 339-344.